Anyone who entered its walls never returned to the village. Most of the time, an unmarked grave would appear on its grounds for each new "challenger." - Player is now informed of the utility of beds in Abandoned Cave. - Added <MM0 to the beginning of Trial 2. - Massive overhaul to Trial 2's transitions. - Made the second torch in Trial 2 properly inaccessible. - Added skipflags to Trial 4. - Retribution in Trial 4 is no longer avoidable. - Added skipflags to the Golem's phase shift dialogue. - HOTFIX: Re-added necessary <END to prevent phase shift dialogue from breaking. - Fixed the Golem not creating the right kind of pedestal when spawning in under the effects of skipflags. - Extra <MYB added to pre-Golem cutscene to give the player more breathing room. - Lowered Power Core HP by 25. - Spawn point of the Overcharged Golem's Power Core moved to hopefully alleviate cheap -1 damage at the beginning of its phase. - Minor changes to main character's facepics. - Toned down strawberry jam in Bad End. - Absolutely massive list of changes. - No really, just play the mod and find out. - Stealth update: Fixed some of Trial 3's Presses not killing you. - Stealth update: Fixed the block sealing the Pillar's entrance coming back too early. - Lowered the length of Trial 2's <WAI's. - Removed smoke from parts of Trial 2's transitions. - Corrected typo in Nexus?. - Made beds more eye-catching. - Improved tiling near beginning of Outside the Pillar. - Added shootable block tutorial near beginning of Outside the Pillar. - Added block friend tutorial in Ordeal ???. - Replaced Game Over and Life Capsule ORGs. - Removed ability to hover with Level 3 Glowing Repeater. - Added small skipflags to various places. - Moved a couple interactable triggers around with <MNP. - Made Ordeal 2's platforming a little more forgiving. - Added non-bouncy, player-only blocks to Trial 3 and Ordeal 3. - Removed repetitive text in Ordeal ???. - Included new enemies in final boss fight to discourage extended periods of camping. Other times, however, it seemed as though they vanished without a trace. OK this sounds cool now lets see if it is in vb's "revieeeeeeeeeeeeeeeeeeeeeeewwwwwwwwwwsssssssssssssssssssssssssssssssssssssssssssssssssssssssssssssssssssssssss"!!! 1. Pfff. A loading screen that isn't recolored??? 6. The human quote (???) sprite is good except the eyes make him look like something out of The Dark Crystal. +2. -1. 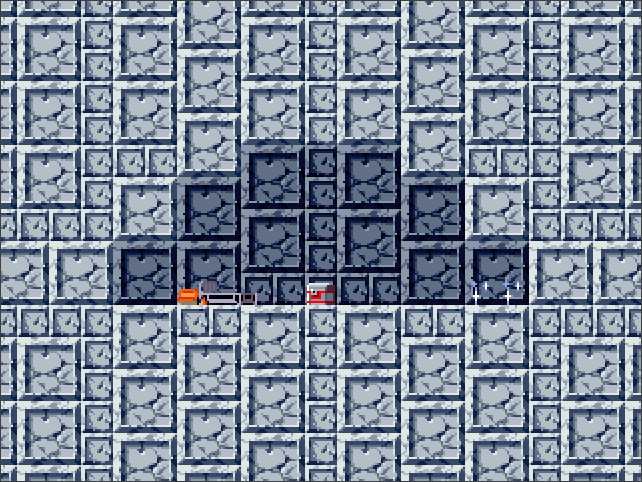 8. some of the tiling in this start room is bad -1. 9. surprise <FLA jumpscare is surprising, but shouldn't there be a teleport animation for the character, or at least have him become smoke instead of a simple <HMC or whatever? -1. 12. So it looks like Jen Kiran Shah Quote has no idea what a life capsule is and just decides to consume it anyways. OK.
13. Having beds as save points is garbage. Instead of just a quick 4 second to do save, I have to read the bed text, say yes, get in bed, wait for like 200 frames, read more text, then continue. -3 because you have to do this after every trial. 14. 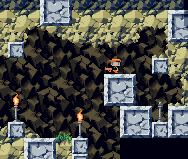 Oh hey the fireball except it isn't the fireball -1 for 3 weapons that are literally clones of cave story's. 15. I like the concept of shooting torches to go on, but you can't go back for some reason even though the other torches are still lit??? +2, -1. 16. Getting to the 3rd torch is stupid because the (not) fireball's range is garbage. -1. 17. Whelp I died trying to get to the 4th torch and am too lazy to restart from trial 1 because I didn't save because beds are the worst way to save your game. Point subtotal: -3 out of 17 possible. Bonuses: Art Bonus: +5. Puzzle Bonus (torches I guess): +5. This mod is good except for the beds and some other things maybe. Yeah I like it 7.8/10. This mod is great if you like puzzles, saving your game via beds, and a confusing plot that makes you want to play more. I'll play this more later maybe when I have more time. Overall, a pretty solid mod. Keep up the good work! I appreciate the feedback, but at the same time could you tell me what you liked, didn't like, and think needs improving without the unnecessary point system? Just makes it a lot easier to read. Anyways, it does not seem like you interacted much with the beds given your complaints. Aside from changing up how saving and healing works, I wanted to add a little flavor text to each one. After reading through said flavor text once, a flag is set and it immediately cuts to the save prompt for all future interactions. As for your criticisms of the second trial, it's strongly implied that the torches go out as you progress, yet it was difficult to portray that without jarring transitions due to how many <CMPs a map can handle. It's also a little silly to expect me to hack weapons to work in wacky ways when they work just fine as is. Yeah I only used the beds twice before giving up. Maybe have it so a few frames before the entire section you were just in goes into total darkness, the previous torches go out, and you can see they have no flames for maybe a second, then have all the CMPS with the darkness. My point system is extremely unnecessary, I'll admit, but I still do it because I find it more fun then just writing down notes as I go along. As said before, the score doesn't really matter, just what's in the notes. I'll try and elaborate on this in future "reviews". 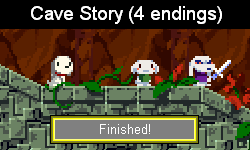 Also, with the weapons, it isn't that I don't like Cave Story's weapons, I just don't particularly like it when someone renames them and they function exactly the same. Maybe increasing the fireball's range to help with torch 3 would make me not so annoyed with this. If this post seems a bit jerky and poorly written, it's because I'm on mobile and the forums on a mobile device don't function very well. Anyways, hope to see more of this mod in the future. 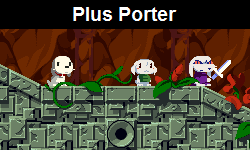 It's been a long time since I played a Cave Story mod, let's see if I can get back into this whole business. I enjoyed this mod. It was creative in having you approach the challenges from a unique angle each time. I didn't quite figure out all the "riddles" the first time around, but they weren't hard to decipher with a bit of trial and error. I would possibly argue that some of the areas were a bit more tricky than they needed to be, but it wasn't anything that can't be overcome by trying it a few times and perfecting your strategy. The scripting was overall pretty polished, I tried to break the map scripts a few times, but you didn't seem to have any loose ends that I could find, so good job with that. The sound effects in some places didn't sound very familiar. Did you do some sound editing in Seatone? If so, good job, I enjoyed the custom sounds. The lighting up torches with the fireball was a really neat idea, but I don't like your execution of it. It would be awesome if we saw some CMP action revealing the new path whenever a torch lit up instead of transitioning to a new room, because that was jarring. The doctor resprite battle has some room for improvement. First off, when it first appears, it spawns in a place that almost always forces you to get hurt at the beginning because of where you're standing. Battling with the doctor resprite with just the machine gun and polar star at level 1 was kind of annoying given that it took a long time to finally drain all of its health. It was also very annoying how many power crystals it takes to upgrade the machine gun. Overall, I found the atmosphere of this mod very interesting, and I'll be interested to see what happens next. Keep up the good work. I'm flattered that you think there are custom sound effects in this. Every sound that plays is vanilla, but I made sure to use sounds aside from those <SOU plays. In particular, I heavily used varying volumes of <SSS; low volumes for wind, higher volumes for unsettling static. Glad you liked that. Seems like there's a general consensus that the second trial needs better transitions. It's going to be a headache to sift through the transitions, but I think I can make it so torches light up one at a time with <CMPs. Worst comes to worst, I can dedicate more than one map to this to help spread the weight of all the characters. Anything to make it look better. Your constructive criticism of the combat trial is a bit of a mixed bag. I made sure to avoid any cheap damage in the beginning through <MYB's to bounce the player away from the boss's spawning location. It's no more sudden than the actual Doctor fight, though this time you need to jump over the projectile instead of boosting over it. Lengthening the fight was also intentional; I didn't want the fight to get blown through as quickly as the original could be due to this being an entire "stage" of sorts. Believe it or not, it used to be longer, though both my playtesters and I realized that it had too much health at the time to comfortably deal with. I can't remember if I increased the amount of crystals needed to go from Level 2 to Level 3 on the Glowing Repeater, but I'm almost positive I left it alone for the transition from Level 1 to Level 2. As it is, one burst of bats gives enough weapon energy to level up once provided you don't get hit too much while collecting the crystals. Thank you for the feedback, though! I have a fair bit more time to work on this now, so updates shouldn't take too incredibly long. Hopefully. I can say that there's something off with not-quote the player's facepic. Especially considering the 'wrinkles' on his face. And his sprites have kinda odd-looking eyes. This looks kinda off, but I guess that's just nitpicky of me considering we're talking tiles here. There's this big examination of various things as if i'm reading a more serious book and I like it a lot. Very rare for a mod afaik, too. As has been noted by others, the time needed for saving can be quite a bit of an annoyance, although I might be less bothered by it than others. "Oh hey a machine gun vs first cave-level enemies, that should be ea- *gets yelled at for shooting*. This is pretty interesting, and i just want to say that giving the player a first warning instead of direct punishment is a really nice way of executing this. Especially at this part, it went a little frustrating. 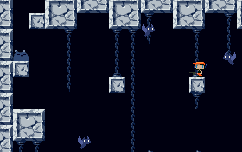 The jumps are a little precise and the bouncy critters and bats make for a bit of trouble. After the first frustration trail I expected this to be a bit more on the harder side. Oh, the same rest room again except with a reward. "Brute strength is not always the answer." So what, am I getting a no-kill restriction again? 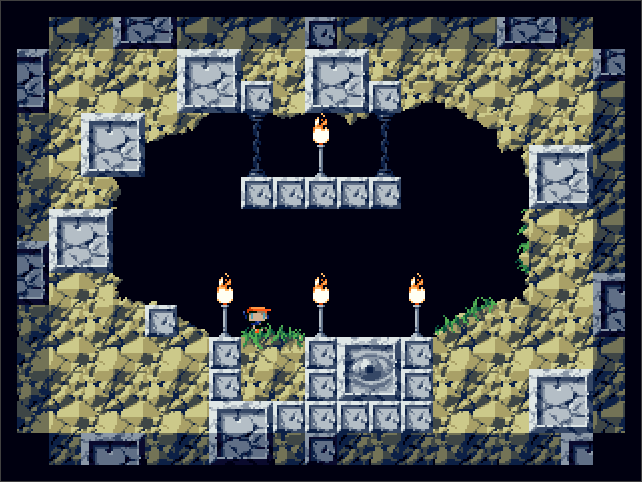 The second trail looks a bit weird but in the context of a dark cave it's more forgivable(and making more tiles to show this better would probably not fit in the tileset, perhaps). Your use of the background here is pretty nice, though. After shooting the first inactive torch, the sudden <FAI felt a bit too sudden. 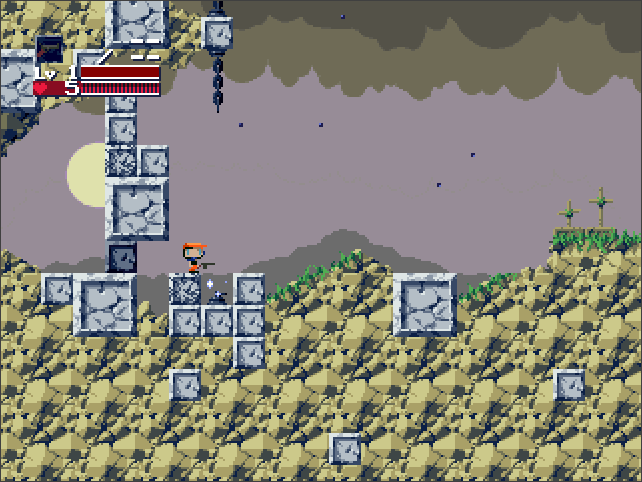 The second torch can be reached physically with a well timed jump. Timing the shot for the third torch felt a little precise due to the fireball's living time. You aren't expecting me to do the spike trick are you. I see how you want the player to do this, but it's not hard to scratch that idea because you don't want to jump into the spikes and do most of it over again. The use of the fireball reaching into spots like these is a good idea, though. After the second trail the game glitched and didn't let me interact with anything so I had to restart the game I immediately went for the third because I like how this mod wor- whoaaaa falling presses!!!! The third trail lived up to it's name, as it didn't give you a chance to sit still. The first turn was a bit more precise though, as the left press above the hole is really good at catching you here. The first part with forcefields is also a little precise because Presses never fall when I want them to due to the bounciness of the forcefields. I really started to notice here how unforgiving this trial was and that one would be very unlikely to do this in their first attempt. This was why seeing that the fourth trial was called "reflexes" made me feel like it wasn't getting easier. But it was more interesting than I actually thought. It gave you little room for timing quickly though. I managed to cheat death though by interacting before lightning struck me, doubt that's something intentional. Noticing the simple stay-jump-stay-jump-etc pattern and holding left when jumping made this more easy. Shooting the torches for hearts though. >Boss goes second phase(which shouldn't surprise me but still) and i recieve 1 damage for no reason. Seeing a boss go second-phase isn't nice when you only have 4 health remaining tbh. The difficulty rises when you have to keep the bats in mind while the crystal likes to stand in the boss making it hard to hit. If the weapon were not too weak and not being able to heal up before the second phase makes this pretty tense. This led me to cheesing this so I can still see what is after this. Sorry for that one. Ending a mod with what I presume is to be considered a bad end once the mod continues, now that's something. One thing that is really nice to see is the amount of variation each trial gives, and the more unique way of things. I also love the amount of detail in words you've put in this. A lesser thing would probably the boss' difficulty, which is pretty hard compared to the previous trials, but other than that, I don't see much wrong with this mod. Overall, this is an interesting and good mod, and I'd really love to see more of it. Ah, I see, that's very clever. I made sure to avoid any cheap damage in the beginning through <MYB's to bounce the player away from the boss's spawning location. It's no more sudden than the actual Doctor fight, though this time you need to jump over the projectile instead of boosting over it. Perhaps my memory is failing me, but I think the difference between this mod and vanilla CS was that the latter had the red crystal float over where the Doctor is and stay there before combat begins, whereas the former has the red crystal come up behind you and go toward where the boss spawns. I can't remember if I increased the amount of crystals needed to go from Level 2 to Level 3 on the Glowing Repeater, but I'm almost positive I left it alone for the transition from Level 1 to Level 2. As it is, one burst of bats gives enough weapon energy to level up once provided you don't get hit too much while collecting the crystals. Well, this may have just been my personal opinion, but given that you had such basic ammunition against a boss that was originally designed to be near the end of the game, the amount of effort needed to upgrade your weapon to the point where the fight will be remotely balanced was a bit excessive in my opinion. Admittedly, it didn't take too many tries for me to beat it, so I understand if your intent was for this mod to be difficult. If I were to compare this mod to the fake difficulty present in a lot of other mods, then this boss battle definitely gets a pass. Looking forward to finding what became of Dad! What that part really needed though, was to make use of the TSC random feature (insert credit) figured out. So it'll randomly choose one of the two. Do that, and it'll really be interesting! Nice touch with the bad ending though. The blood splatter was a bit jarring, but now that I think back, there *was* that blood stain in the corner... Nice touch, it brings things full circle. I do like the reminiscing after each successful trial... but... Hmm... Getting nitpicky, it makes more sense to me to have a flashback if you choose to rest in the bed. Having it right after the trial could make sense, though I did find it a bit weird from the PC's perspective. Though if it's just a storytelling technique, or if the tower or the Dad is watching over him... Well, anyways just a thought. Oh! Intrigue! Yes, I do somewhat enjoy being teased with learning bit after bit of the prologue. It read nicely enough, and I'm intrigued to find out what happens next! -Loved the darkness trial in its entirety. Too short! Was hoping for more xD Clever and yes, I tried to do a pixel perfect jump next to the death spikes 2 or 3 times before wising up. Good stuff. -Haven't explored all the options yet, like shooting weak creatures in trial 1. Will have to go back and see what I can do Will he turn into a weak creature himself?! -I guess that's enough for now. Nice work. Felt pretty complete, but lacking an ending. Wonder how much further the story can progress after reaching the top?! Seems like most of the issues you had should be alleviated in the next update. Glad you like the mod so far, and I appreciate some of the ideas you had! I may end up incorporating at least one of them further down the road. About your recommendation of adding randomization to Trial 4: one of my minor goals for this mod is to get as far as possible without resorting to ASM hacking outside of what Booster's Lab can do by itself. I can't remember if Chef's KILLJOY mod from last year used that new randomization TSC command or not, but I do remember him saying that RNG is hard. About your recommendation of adding randomization to Trial 4: one of my minor goals for this mod is to get as far as possible without resorting to ASM hacking outside of what Booster's Lab can do by itself. You actually don't need to use assembly to get randomization with TSC scripts. The game's time can be used as a semi random number generator, which can be accessed by using flags beyond the recommended 7999. According to RuneLancer, this should work for flags 8800-8831. I've tried this with flags 8800-8802 and they've worked for me. I haven't tried any beyond that, but I'd assume that it would also work up to 8831. Very interesting. It'll take a little bit of tinkering with flags to get it to count up to X amount of successes, but this will definitely make it a lot more fun. EDIT: Just realized that I accidentally deleted an <END when adding in one of the new sets of skipflags. Posted an updated link with the necessary hotfix; still the same version number since the change was incredibly small. I disagree, I thought the weaponry available worked fine for the fight. Once I got used to the boss's gimmick I was able to avoid a good chunk of stupid damage, and the second phase was a good opportunity for players to either play offensively or defensively (I played the latter mostly) without making it too easy. I was on my toes during the fight but I never felt like the fight was overly tedious or unfair or even just too difficult. Might as well post now to clear things up a smidge. Due to the modding contest that has been running since the beginning of this month, I'm putting Ordeal Pillar on the back burner while I focus entirely on my contest mod. Don't fret, however, because I'm definitely not going to abandon this one. The same thing happened to Inner Demons, though that one wasn't announced due to its secretive development. Feel free to play through v0.4.1 in the meantime and give me your thoughts! Spoiler: Coming Soon™ to a Pillar near you! At long last, the time has come. The official v1.0 release of Ordeal Pillar is finally out! It's hard to believe that I've been working on this over the course of an entire year, but here we are. The OP has now been updated with a new download link, new screenshots, and the mod's very own trailer. Hope you guys like it, and don't forget to leave your thoughts and feedback! Oh hey, this mod! Great to see this is still in development. I won't get to try the next demo for a while since I'm really busy right now, but I've put this on my list of things to do this May when I have a large chunk of free time. Look forward to playing the next version. 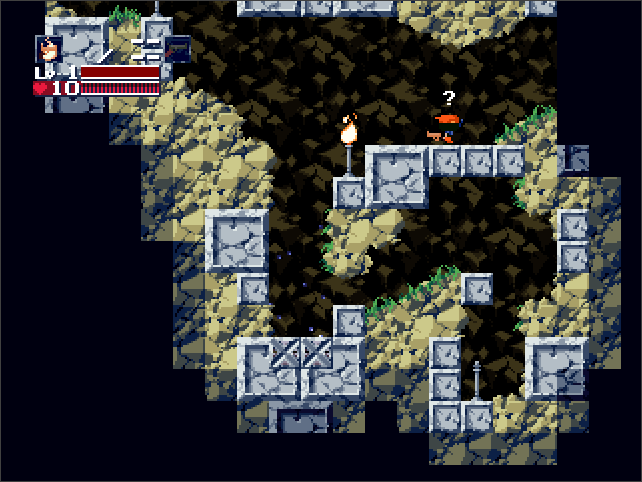 @SeasonsOfDestiny - That's the biggest Cave Story mod I've played in a long time... Bravo! Ahhhh, it's too good... I need to make a list of my favorite CS mods... This deserves a spot. Oh! Ran into one bug off the bat. At the start of the game, after the gate to the Ordeal Pillar opens up, there is a text along the lines of, turn away ye lacking of courage. At this point I had Sam run back to the cave and sleep. lol. Great job! I liked the demo, and the completed version 1.0 was even better. Tasty dialogue, never boring thanks to the interesting main character and writing style. (thank you for adding skipflags though!!) I like how the stone statues talked with spaces. Creative. Graphics wise, I'm a little put off that Sam didn't get a non-Quote portrait, but that's about the only issue I had. Plenty of expressions though! Excellent looking map design. Gotta hand it to you. Hardest ordeals... spikes and moving blocks 2. Not so hard, but kept making little mistakes that forced me to restart. I felt like the boss at the end, crying GRAHH! Easiest ordeals... probably the reflexes ordeal. Still fun. Could have faster ticks! Didn't try getting the bad endings yet, and kept the gun powered down and got the crab. What a twist at the end. x) Oh, dad... Ha... ha...hGRAHHHH!!! PS - Something random: I artificially made some of the bosses harder whenever there was a red crystal or orb. I wondered if had to avoid hitting the main body and just focus on the crystal/orb. So, I ended up spending a lot of extra time carefully aiming. Was thinking dad might be a statue or something.